Here it is THE NEW WALK BOOKLET….. Down load it now! If you know anything about this topic and have something to add, I’d welcome your input. Please correct any errors too. I’m jotting this down with the thought that I ought to explore this story sometime. Joseph Pennington owned 1500 acres of land near the site of current-day Raymond Terrace on the Williams River. Somehow before 1828, he lost the land to Simeon Lord. I’m not sure how. He finished up on the Myall River north of Port Stephens in charge of a team of convicts who were felling timber. In the process, he befriended and eight year old aboriginal boy called Billy. Billy let on to Pennington that some of the convicts were misbehaving with the aboriginal women. The convicts appear to have got hold of this fact because they took billy up the river “fishing” and he didn’t return. Pennington later found Billy’s body by the river and buried it. Pennington was afraid to raise the issue with the convicts, so he said nothing until he was able to contact Robert Dawson, the Chief Officer of the AA Company. Dawson then investigated and had four convicts charged with murder. They were sent to Sydney where they were tried and found guilty. The Governor at the time appears to have held Dawson responsible for causing problems because he ordered that the convicts were to be returned to Port Stephens where they were to be hanged. The impending execution caused much stress at Port Stephens. The convicts were restless and the officers of the company were understandably nervous. In the event, the execution was called off because some aboriginals on an outlying station injured a convict shepherd and a chase party was organised to hunt for the aboriginals. The four condemned men were instead sent to Norfolk Island where some of the mutinied, captured a boat and sailed to New Zealand. They were eventually re-captured and executed however. Finally, Pennington was drowned off Port Stephens whilst trying to rescue people. He was drowned in the company of an aboriginal person. HAD THE CONVICTS SETTLED A SCORE OR WAS IT REALLY AN ACCIDENT? THE 2012 WALK TO TAHLEE. The 2012 walk has had to be postponed until FEBRUARY 2013. There are a number of reasons, avaiability of guides and other clashing events. We hope that the weather will be slightly cooler than last year. Well you should know a fair bit about The Old AACo Road from Karuah to Tahlee(et v.v.) by now. However, if you’ve looked at The First Walk Booklet back in 2010, you’ll see that back then, we didn’t know where No.1 Farm really was. Now we do. And the really exciting thing is that it still exists after 180 years. Here are three stories that’ll tell you how we found it. Because of the considerable amount of documentary evidence left by the company, The Australian Agricultural Company has been the subject of much academic research. The early history of the Company was also fairly controversial and it was populated with larger than life characters engaged in momentous events. The couple of decades immediately following the foundation of The AA Company in 1823 were decades of immense change for New South Wales and in particular for the areas chosen by The AA Company to be the target areas for development including Port Stephens and the Karuah River Valley. However, the archaeological studies of the impacts of The AA Company have not matched the academic studies. This short story does not claim to be an attempt at archaeology, but it does pursue history on the ground to match the documentary research. Indigenous history in Australia is continually facing the fact that physical history disappears at a rapid rate. Significant sites such as trees with bark removed for the building of canoes or the making of shields have very limited lives. Traditional sites for spiritual and cultural activities can become difficult to recognise within a few decades and after hundreds of years one can’t expect much to remain of these areas. In European eyes, buildings and monuments form much more explicit proof of existence and the battle for recognition by Aboriginal people for the things and places they hold dear can be very grim indeed. So it is with No.1 Farm. The site of No.1 Farm didn’t ever contain buildings of any significance. It consisted mainly of roads and canals and ditches and rock walls. It was built by convicts who laboured intensely for just a few years and as soon as it was finished, it was deserted. Who could expect to find that any of it would remain. Indeed, the prospect that any remnants would still be there have been so remote that no one has gone looking. No.1 Farm shows up on a number of maps produced in the 1820s and 30s. Given that Robert Dawson, the first Chief Agent of The Australian Agricultural Company first set his mainly assigned convict labourers to work on the farm in 1826 and his successor Sir Edward Parry closed it down in 1831, this is to be expected. So any relevant maps can be expected to be from this narrow time window from 1826 to 1831. This 1828 map was being presented to the Court of Directors in London and was to be used by them to negotiate for better land than they had tentatively been granted. These places are clearly delineated: The Karuah River, Sawyers Point(later Karuah), Tahlee House and The Settlement (at Carrington). 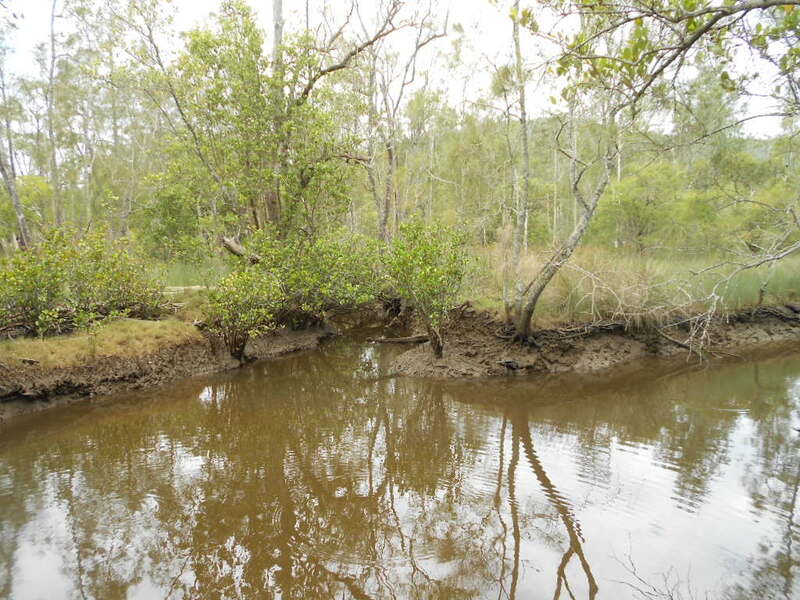 Between Sawyers Point and Tahlee is a cove – No.1 Cove and a creek flowing into it Yalimbah (or No.1) Creek. At the very top of that creek is the indistinctly labelled No.1 Farm. 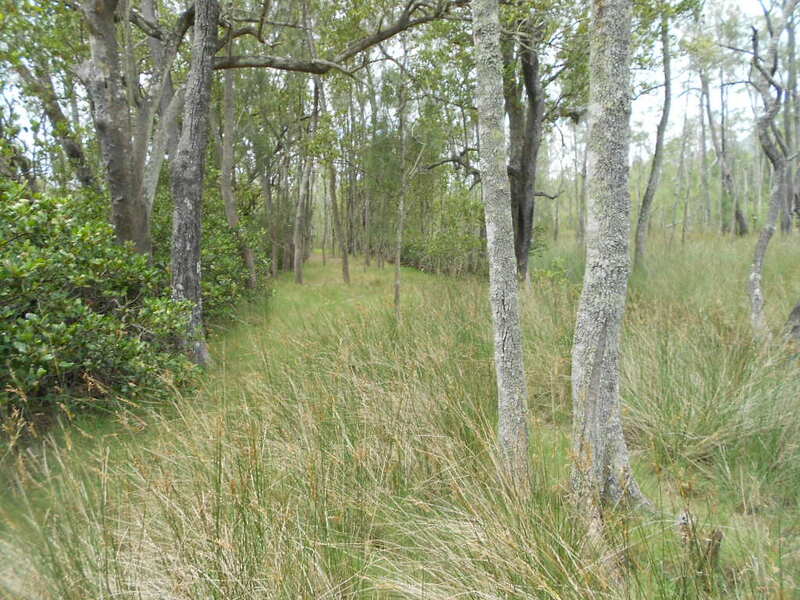 This is one of the first references that places the farm at the head of Yalimbah Creek. Another geographical marker for the farm is its relationship to what is labelled on the map as a High Rocky Range. An 1826 map (First Settlement Port Stephens, New South Wales 1826) labels Yalimbah Creek as Yalinbah Creek, but even today, the name No.1 Creek is applied by locals almost without exception in spite of the fact that the name Yalimbah Creek is shown on most maps of the area. However, all maps show the cove into which the creek flows as No.1 Cove. This map has been the cause of some confusion among scholars. At first glance, it clearly shows No.1 Farm and with it, the end of Yalimbah Creek. The farm’s position in relation to Yalimbah Creek is accurate, but the track leading to it is not. Lest this work be attributed to the fastidious John Armstrong, Company Surveyor, a pencil note shown above from the top right hand corner explains that this is a: “Facsimile of Armstrong’s Sketch Port Stephens Settlement 1830”. Elsewhere on this map, a mirror image of a pencilled note from the other side of the paper informs us that this is “Sketch of … path from the Settlement”. This is further evidence that this document was not meant to be regarded as an official map. That it is hastily and inaccurately sketched is supported by the misplacement of the range of hills shown as running roughly north north west of Tahlee House. In fact these hills would lie directly across the path shown as leading to No.1 Farm. The conclusion is that the path to No.1 Farm should be shown as being much further north and circling around these hills. In spite of other inaccuracies, the positioning of No.1 Farm at the head of Yalimbah Creek does support other clues as to the likely whereabouts of the remains of No.1 Farm. This map looks unpromising at first glance, but once again, No.1 Farm can be seen in position at the very head of Yalimbah Creek and in the same relationship to the “High Rocky Range” shown in Map 1. So, if we were to go looking for whatever remains of No.1 Farm, we ought to be looking at the point where Yalimbah Creek begins. Following the logic that the early maps indicate that there was some pretty feverish activity at the top of Yalimbah Creek, let’s look there! These days, the luxury of Google Earth pictures lets us look down on the scene without leaving our personal computer. Immediately one site draws our attention. A large red(?) 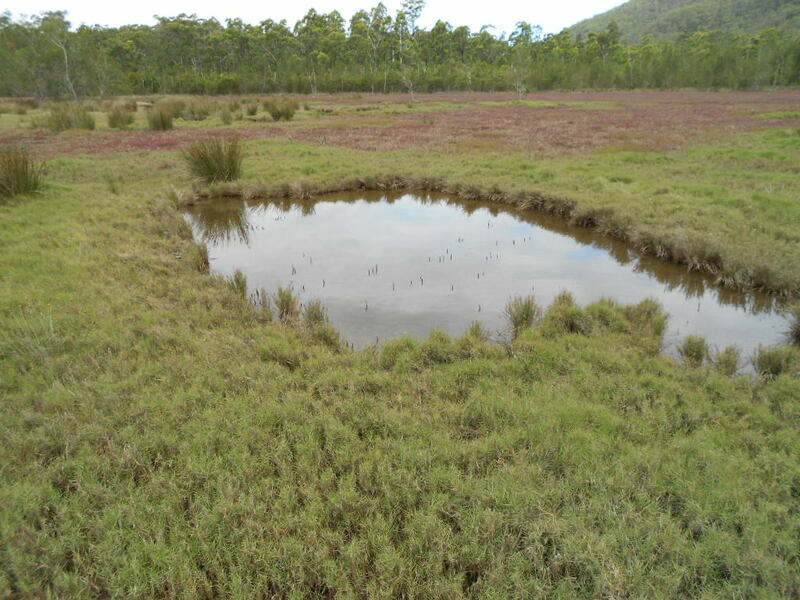 circular space at the point where the tidal flow of Yalimbah Creek ends! This is a mysterious site. Why is it red? What is it? Does it have any connection to No.1 Farm? The only answer was to go and look! The area is enclosed by dense undergrowth. Just getting in is difficult. The area is tidal, so, at high tide it’s pretty damp. 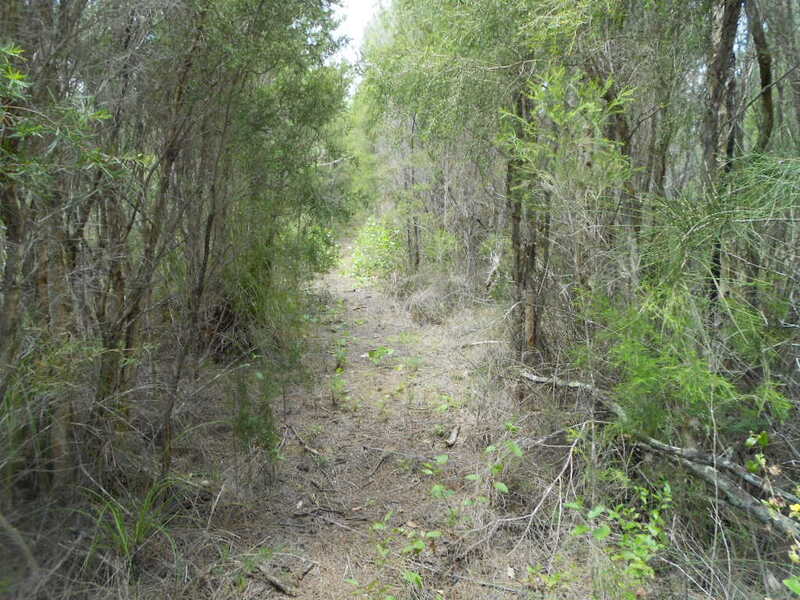 The area is privately owned even though it adjoins the Karuah Nature Reserve. The owners of the property were intrigued by the mystery too when we talked about the site. They had seen things there, but couldn’t explain them. They were happy for us to look and they joined us. (Murray the mastiff joined us) The area seems to have been cleared. The red colour is from a plant growing in the salt water. The area is about 200 metres in diameter. It has some shallow holes dug into it (see below) and our metal detector found some underground narrow, straight lines that could be drainage gutters. 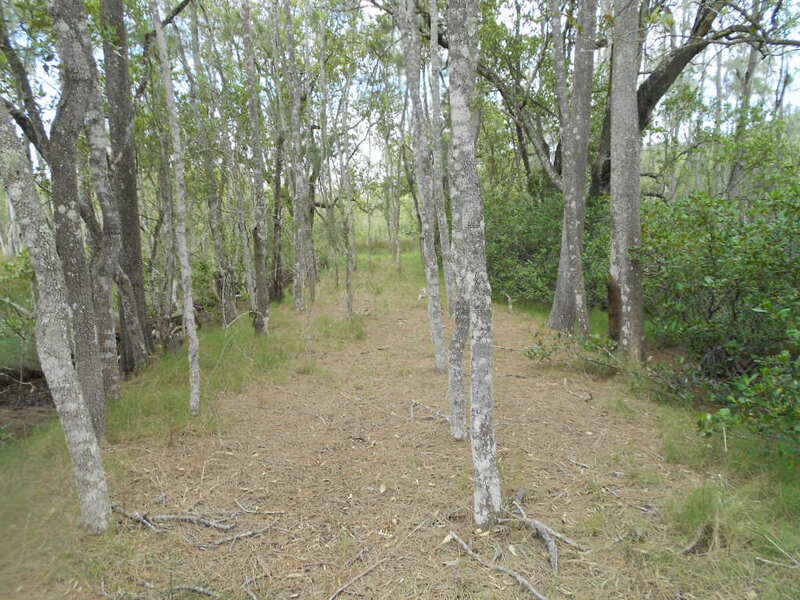 As mentioned, the whole area was surrounded by dense undergrowth, but as we reached the edge of the clearing we found a clear pathway or rather, roadway, because it was about 3 metres wide. This path shows no sign of recent use. 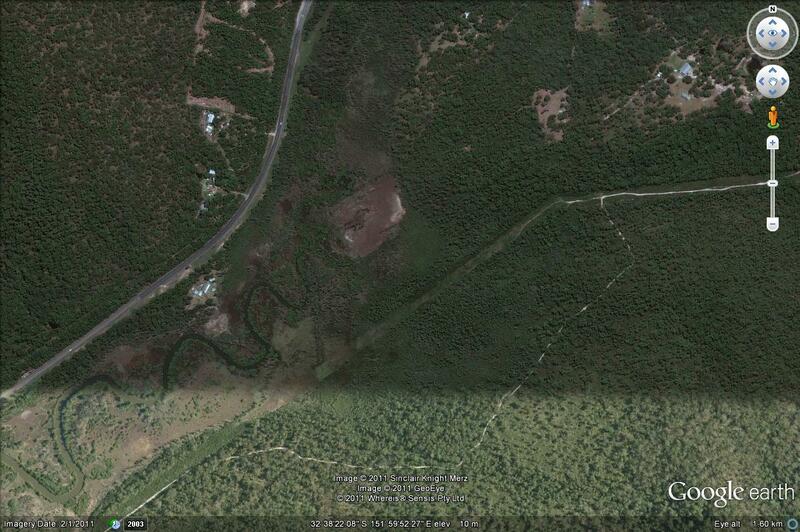 It is a straight line that can be seen on Google Earth. It is raised maybe a metre above its surrounds and on either side there are quite deep channels draining the tidal and rain water away. We haven’t dug into the path to see if there is a rock base underneath as in the Old AACo Road, corduroy section, but apart from the obvious non-use and the undergrowth it seems similar. Go back to the Google Earth picture … this photograph is showing the path between the two markers. It continues in a straight line until it reaches a small constructed harbour or basin dug out from the side of Yalimbah Creek. This last photograph gives a sense of the site. The straight lines and the sense of solidity of the construction work give the site an eerie feeling. At this point of the road, it is approaching the small basin or harbour. 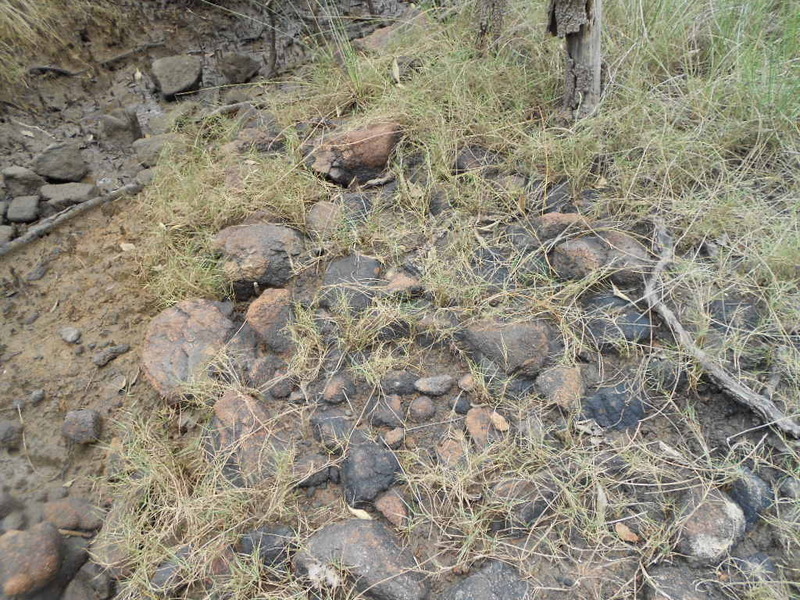 Here, on the banks of Yalimbah Creek is surface evidence of the rockwork that appears to be below the surface and that is suppressing the growth of plants on the roadway. This rock must have been carried to the site and it has been broken into roughly uniform sizes. It is similar in form to that found further down the creek on the Old AACo Road. At various points along the road are what appear to be the remains of rudimentary bridges. The water here is salt water from the daily tidal inundation. This photograph was taken at about halfway down the run out tide. These photographs give some sense of the excavations that form the small basin. There are the remains of a bridge and perhaps a jetty, suggesting that perhaps stone was transported up the river to this site from the quarries downstream. The channel shown in this photograph runs beside the road that extends on the other side of the basin and drains part of the area. The whole of the site within 200 metres or so appears to have been drained. At the basin, the road which travels in a straight line from roughly the north east turns roughly south and continues in a straight line. We have yet to trace the road to its conclusion in either direction, but it is headed in its southerly arm towards The Old AACo Road. As is mentioned, clearing beneath the powerlines shown has removed a section of the road. Later in this story, we’ll look at what the documents say about what happened at No.1 Farm between 1826 and 1830. Suffice to say here that a considerable amount of convict labour was spent on No.1 Farm. Walking around the Yalimbah Creek precinct allows the visitor to get some idea of the massive amount of human labour that was required to dig channels and harbours, to break and carry rock and to build bridges in an environment that was continually filling and emptying with water to the rhythm of the tides. There would have been short time periods when the convicts could have removed mud before the space they dug was full of salt water again. Hundreds of metres of road have been constructed in the most horrendous circumstances. Any visitor to the site today will also gain some concept of the insect and snake life that must have added to their fears and pain. In addition, the convicts had to walk some 5 kilometres or more just to get to the site to begin work and then walk the same distance home at the end of their day. It is now 186 years since work began on the ill-fated No.1 Farm. What an amazing set of circumstances that so much still remains! Further Clues … What do the documents say? As is mentioned above, one of the fascinating aspects of The Australian Agricultural Company for historians is the paper trail that was left. Not only were despatches regularly sent back and forth from Australia to London, but also the various participants often wrote accounts of their experiences and many of their diaries and letters have been published. Both Robert Dawson and Sir Edward Parry have left detailed accounts of their activities. Information about No.1 Farm can be discovered either directly or by inference from these sources or from commentaries by scholars in the interim. It is fascinating that our view of No.1 Farm is still being coloured by a dispute that led to the final dismissal of Robert Dawson, the Chief Agent of The Company and the instigator of work at the No.1 Farm site. Of No.1 Farm, Dawson reported in 1828 that “No drainage has been performed there beyond an open ditch on two sides at the foot of the Hills, and several drains in the bottom to carry off the surface waters of the Hills above……. A small quantity of land amounting to about 30 acres has been reclaimed by means of a very slight embankment and a small tide sluice…. The estimated expense for draining does not exceed one hundred and forty pounds.” 1This being an excerpt from Dawson’s Report to The Colonial Committee of Management sent to investigate his activities at Port Stephens. One member of that Committee was James Macarthur who has written comments in red in the margins of Dawson’s Report and who subsequently made his detailed commentary on Dawson’s work and this report in particular. Before referring to Macarthur’s words though, it needs to be borne in mind that Macarthur was not unbiased about Dawson. Under Dawson, many AA Company sheep were lost. This may have been due to Dawson’s mismanagement, but in his Reports, Dawson continually refers to the fact that sheep he had bought from the Macarthur family and from other members of AA Company’s Colonial Committee had turned out to be diseased and or very old. In 1828, Dawson had refused to purchase any more sheep from these sources. It was therefore in his own interests for James Macarthur to blacken the name of Robert Dawson. Indeed, Dawson’s choice of a site for No.1 Farm and his expenditure of resources and labour on the site played into Macarthur’s hands. So, Dawson may well have been guilty of downplaying the expenditure on No.1 farm while James Macarthur may well have been exaggerating it. This Report not only assists in positioning No.1 Farm, it also gives an estimate of the work done. 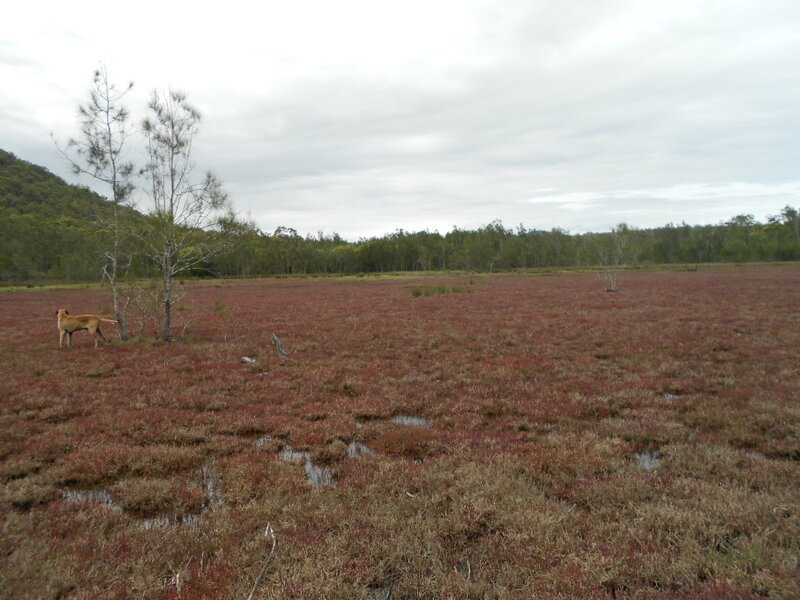 The placement of the site at 3 miles from Carribeen (Carrington) and in a salt marsh agrees with the discovered site. Macarthur disagrees strongly with the expense suggested by Dawson above, and he strenuously criticises Dawson for his choice of a site. A number of academics including Damaris Bairstowe3 and J F Atchison4 have written about the rights and wrongs of Dawson and Macarthur’s arguments and most have expressed sympathy for Robert Dawson, given the difficult and crucial decisions he was continually forced to make. However, Dawson’s Report to The Committee of management is often short on detail and weakly argued. The Committee was certainly provided with sufficient ammunition to replace him. They chose James Macarthur to fill in and later the position was given to Sir Edward Parry. The extent of the enclosure with the outer drain and the Creek is 150 acres. The poor soil on the verge of The Farm was not enclosed for cultivation, but with a view only to make the enclosure more complete. The greater part of the soil I consider will be valuable in as much as it is the only place near the Establishment at Port Stephens that is susceptible of cultivation….. The number of men employed there is eight and one Overseer. In April 1827, Dawson recorded 24 workers as being specifically employed on No.1 Farm. However, he also lists numerous others who could have been employed in associated activities. There were for instance 12 employed under the principal Mason in quarrying etc; 14 employed in fencing; 20 employed in sawing; 4 employed in hurdle making; 10 employed as bullock drivers including overseer; 10 employed at burning off timber, road making etc including overseer and 4 employed in the chain gang, quarrying stone etc. This gives a total of 98 workers. The figure of 80 persons suggested by Macarthur’s informant may have been only a slight exaggeration on occasions when it included roadworks, fencing and clearing. Given that in the intervening 180 years, no one has seen fit to attempt any sort of agriculture in the Yalimbah Creek precinct (excluding fishing and oyster farming) and that there was almost universal condemnation of Dawson’s attempts to create No.1 Farm the question arises …. Why did Dawson do it? One fairly obvious answer lies in the number of workers he had at his disposal and the need to keep the convicts under some sort of control, given that he was still exploring the country and developing projects. As mentioned, No.1 Farm was 3 miles away from the Establishment and “men returned each night to Carrington from No.1 Farm”9. This travel ensured that the men would be exhausted at the end of each day’s work, thus lessening the likelihood of misbehaviour. The more likely explanation though is Dawson’s background. “Dawson’s earlier experience caused him to follow approved English practices of placing these sheep on what he described as “salt water runs”. 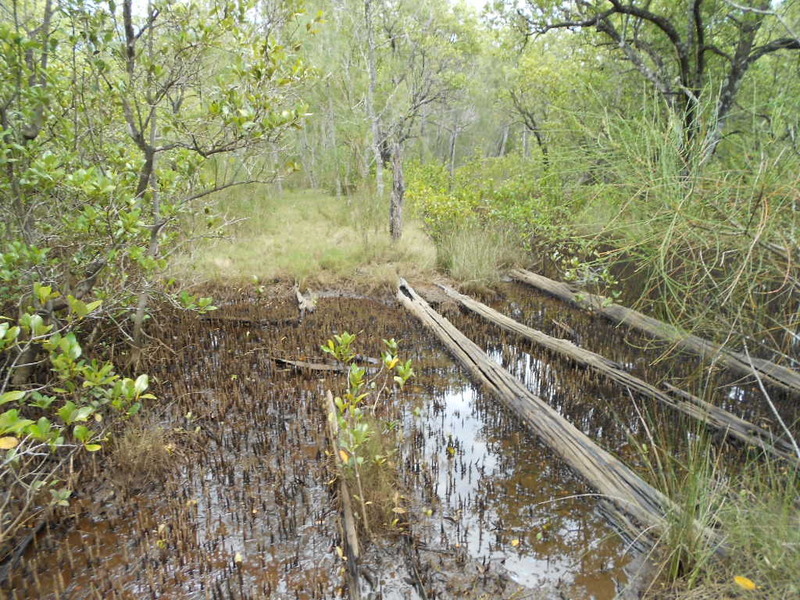 These were pastures subject to inundation at high tide. Instead of placing sheep on the dry pastures north of Stroud, around the Avon and Gloucester river valleys, Dawson kept most near the base of operations around Port Stephens and along the lower Karuah River. Closer supervision of the Agent’s actions (by The Committee) during these early months would have prevented this mistake – a fairly obvious error for an English sheep man to make without prior experience of Australian conditions.”11This reveals another source for Macarthur’s concern about Dawson’s actions. The Committee had not been monitoring what was happening at Port Stephens and could be held responsible by the authorities in England for their shortcomings. There is here, documentary evidence that a significant amount of work was expended upon No.1 Farm at the site evident at Yalimbah Creek. It is reasonable to conclude that the bulk of the work was on roads, ditches, bridges, channels and clearings. These are the things that are evident today. While there is evidence that locals up to around 80 years ago occasionally used the roads as a thoroughfare, other roads such as The Old AACo Road and later the current main roads soon took over, leaving No.1 Farm deserted as it is now.